Consistently reproduce colour in your photography. In its simplest form, colour management is the process of balancing your monitor to achieve colour consistency between your display and final print output. The end goal is to have images displayed on your screen more closely match the final printed product. Follow the steps in the steps below to achieve more consistent results across your screen and final print output. The first step towards achieving colour consistency between your screen and final prints is using a monitor calibration device, such as X-Rite’s ColorMunki Display, to calibrate your screen. Calibration devices attach to the front of your monitor and analyse a series of colours and grey levels displayed on your screen via the device’s software. Often the most prominent issue seen in uncalibrated screens is the brightness being set too high under default factory settings, meaning that the final print output appears to significantly darker in comparison. 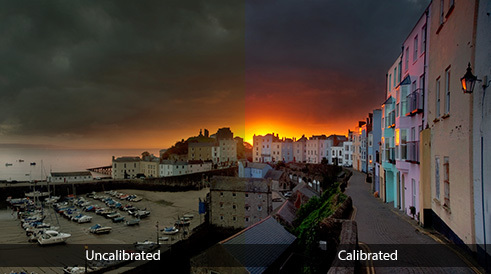 One of the primary goals of a calibration device is to set a more appropriate screen brightness. More advanced devices also measure your room’s ambient light levels to adjust the brightness, further helping to avoid prints which appear too dark when compared side-by-side in the same lighting environment and conditions. 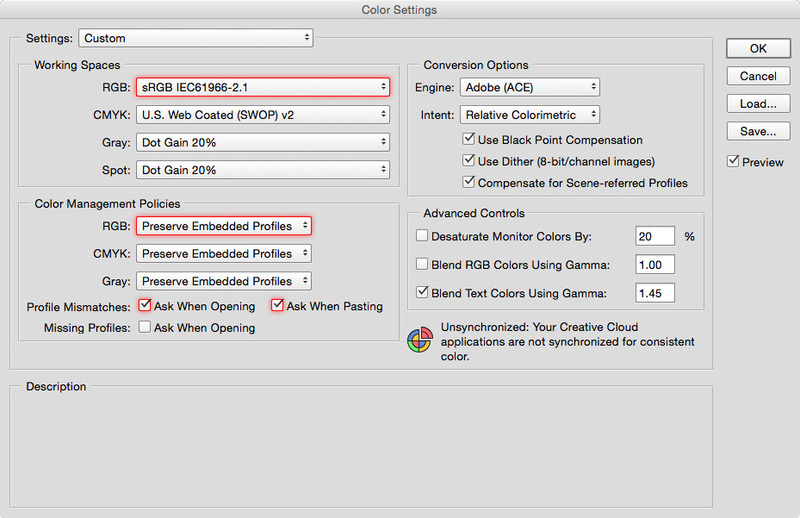 Using the readings taken during the calibration process, the calibration software creates a colour profile which instructs your screen to render each colour in a way that will match the print output. N.B. Although all monitors can be calibrated to at least a basic level the accuracy of the results will vary depending on the quality of your screen. A low-quality, budget monitor which has been calibrated will still provide sub-par results. Common recommendations for colour critical work include Eizo, NEC and Dell’s UltraSharp models. 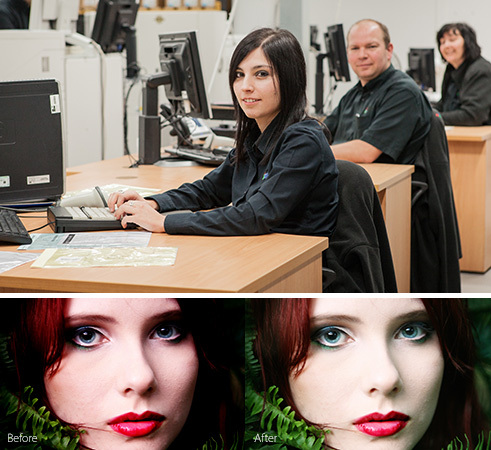 At Loxley Colour we use Eizo CG246 displays. It is important to note that even the best screens will still need to be calibrated. Detailed monitor reviews and recommendations can be found at TFT Central. It is essential to ensure your images are in the appropriate format before placing and order with Loxley Colour. 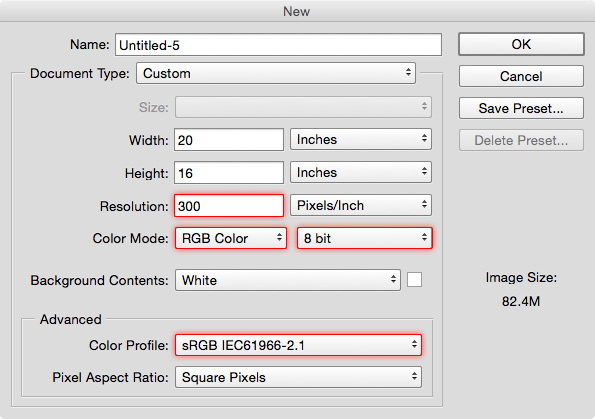 All images should be high-quality 8-bit JPEGs in either the sRGB, Adobe RGB or ProPhoto RGB colour spaces. 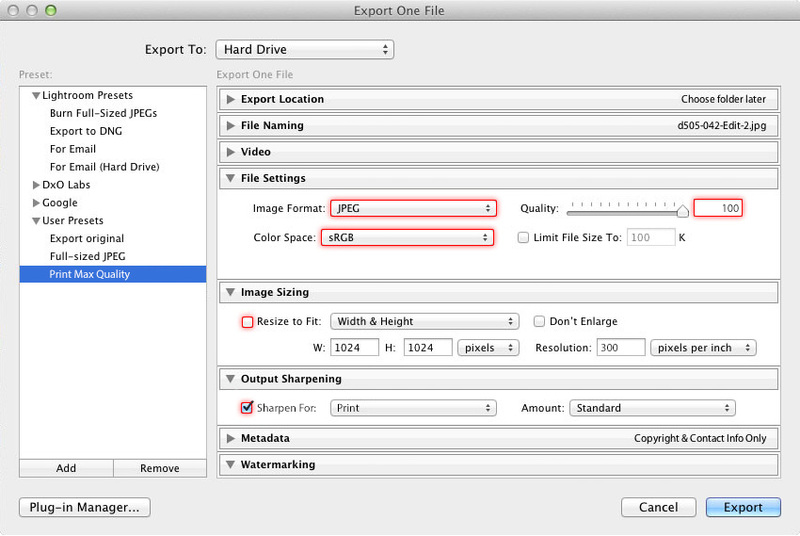 We would recommend creating and saving an Export Preset using the following settings for future print use. We would recommend creating documents using the following settings for future print use. 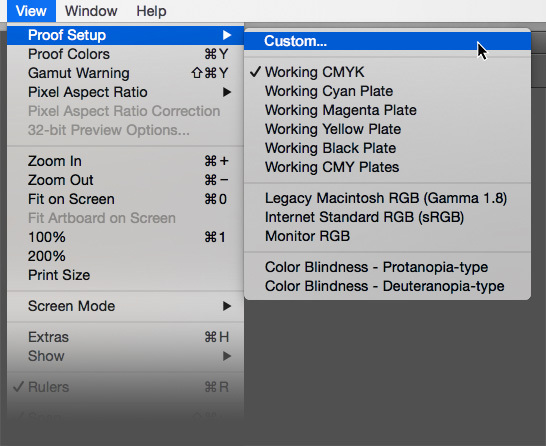 We would recommend the following colour settings within Photoshop (Edit > Colour Settings..). Profile Mismatches: Ensure Ask When Opening and Ask When Pasting are both checked. An essential part of the overall colour management process at this stage is gauging how near/far your monitor is to our print outputs, and to help with this we offer a free test print service. For best results, submit a test print order containing a range of images which cover a wide spectrum of colours. We also recommend you include a B&W image, as these can help with any density adjustments you may need to make. Use the voucher code 'CALTEST' to order free test prints via our website, or alternatively in Loxley ROES through the 'Test Prints' section (Catalog Menu - Sample Packs - Prints - Test Prints 8×6). Important: When ordering, make sure to select ‘No Colour Correction’. Failure to do so will mean your images will be printed from a version of your file which has been altered for best results by our Colour Correction team, which will make any print to screen comparison inaccurate. When you receive your test prints the next step is to compare the print results with what you see on your screen. To help overcome this, programs such as Photoshop and Lightroom use a process called soft proofing, which use print profiles to match the screen to the paper type. Our soft-proofing profiles are designed to simulate the effects of the different types of print process on offer at Loxley Colour. Soft proofing displays the files based on the printer colour space in conjunction with the monitor profile. If done correctly, the image file itself is not altered, the pixel values of the image remain untouched. The pixels displayed on the monitor are mapped so the colours of the image are as close as possible to what a final print would look like. We have a range of profiles for you to download, from Fuji photographic lustre paper to Hahnemühle fine art. Each profile will have a slightly different screen output as it tries to mimic the process on offer. It’s important that the profile is used for proofing only and not saved to your files. Your test prints are printed on Fuji photographic lustre paper and should be compared to the same image file on screen using the profile ‘Loxley Colour Photographic Lustre&Gloss’ available via our Print Profile Download page. If you find a monitor-print match then you should be able to order prints knowing that the output will be very close to your monitor, assuming you do not choose to use our Colour Correction service (includes brightness adjustments). As monitors very gradually dim over time, it is advisable to keep the prints & associated files safe and check periodically that your monitor hasn’t shifted over time. When different papers and print processes are used, such as Giclée Fine Art printing, make sure to utilise the appropriate profile when soft-proofing. It's important that the profile is used for proofing only and not saved to your files. A good technique to Soft Proof within Photoshop, is to take your chosen finalized image and duplicate. This duplicated image can then be tweaked with your chosen ink and paper settings, allowing you to keep your original file intact, and you can compare side by side to bring your duplicated image close to the original. Now comparing your images side by side, you should be able to observe any differences on your soft proof image. You can then make small changes to Levels and Curves, to bring your image as close as possible to the original, before saving for print. These print profiles are available for download to use when soft proofing your prints. 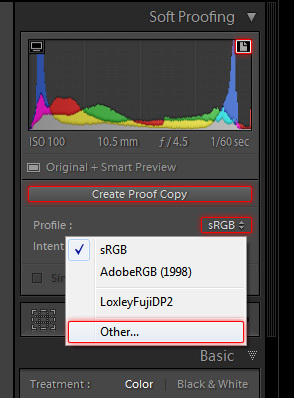 Adobe Lightroom users: Please note that only RGB profiles will work in Lightroom. When you submit an order with Colour Correction selected, each image is individually assessed for colour and density by our highly qualified technicians using high-end professional monitors. Using their expert knowledge, they will adjust each image to give the best print result. 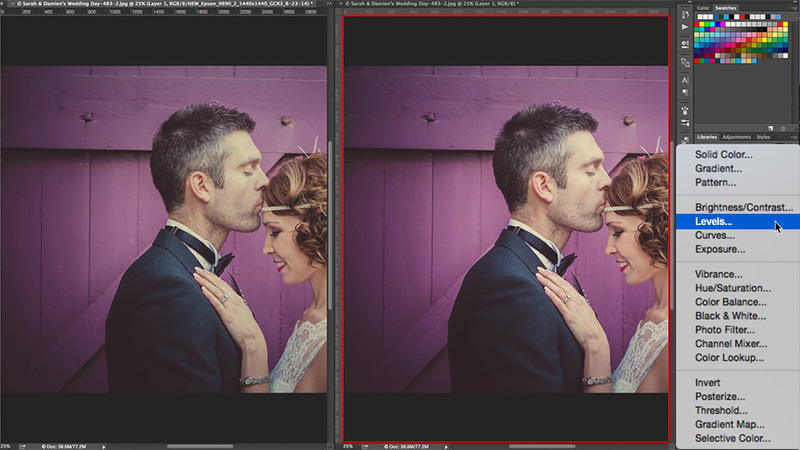 If you select 'Do Not Colour Correct' we will make no adjustments to either colour or density. In this scenario, it is important that you have a fully calibrated workflow, and are confident that you have achieved a good screen-to-print match when ordering via Loxley Colour.